Need to learn how to register for spring classes? 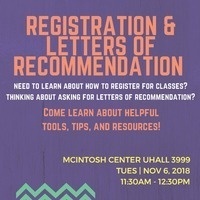 Thinking about asking for letters of recommendation? Come learn about helpful tools, tips, and resources. Also, there will be snacks! Sponsored by the University Core Curriculum and the Academic Resource Center.